I'm going to try and keep up the doodles, despite being in a perpetual state of information overload over the last nine months. I certainly don't subscribe to his ALTA (" asymmetric language trend analysis") reports but I've watched a few YouTube videos featuring Clif and his pseudoscientific predictions. 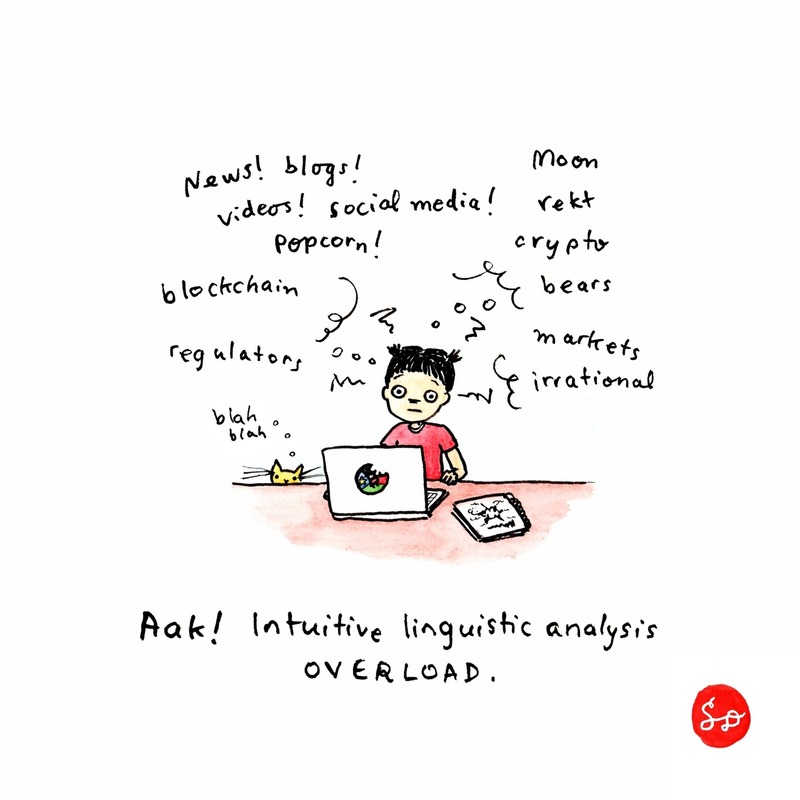 Clif claims that the world of cryptocurrencies is a natural fit for this type of analysis as the lexicon contains many new and unique words and meanings specific to the space. Aside from the imbalance of noise to signal, the constant stream of information and toxicity of interactions (e.g. Reddit, Twitter) is probably too much for most people (especially sensitive or intuitive types) to handle without compartmentalizing. As humans are not bots, the daily absorption of this type of content is not emotionally sustainable without self-care and the ability to keep one foot, or preferably both feet, grounded in reality. I've somewhat decreased my daily exposure to all things Bitcoin since realizing that the intensity of the initial fall down the rabbit hole is not sustainable over years and decades (unless maybe you are Roger, but then I'd still recommend having some close friends who can honestly tell you to take a break as needed, if even for an afternoon). Although I can't draw my doodles without doing an adequate amount of "keeping my finger on the pulse", I can be grateful that my children keep me busy doing normal people things as well. Signal to noise is definitely insane, hence I never chastise people for muting others on Twitter - nobody has an obligation to listen to anything they don't find useful. “IF YOU FEEL YOU NEED TO TAKE A BREAK FROM ACTIVISM, THAT IS ALWAYS THE RIGHT THING TO DO. IT’S ALWAYS BETTER TO GET RESTED AND COME BACK THAN TO BURN OUT AND GET BITTER. Overload is why I can't consume Twitter at all anymore. Broadcast medium only. I'm pretty sure the only reason most people consume Twitter is addiction. It's like TV but worse. true @ryan. Twitter is addiction. While a lot of stuff is often overwhelming, I am very grateful to have a lot to do all the time than have nothing, I guess?